Vintage Higgins Glass is a functional and beautiful expression of the modernist art. The modernist movement stressed freedom of expression, experimentation and an often radical departure from, and rejection of, the traditional. Within the visual arts, color and shape were no longer merely for the depiction of nature but rather were seen as essential elements in their own right. Higgins glass certainly figures prominently within this movement. With its high level of practicality and a visual aesthetics reminiscent of Kandinsky, Mondrian and Malevich at the height of their respective careers, the glass art of Michael and Francis Higgins remains highly sought after by both museums and private collectors all over the world. That was how Michael and Francis Higgins saw their work when they founded The Higgins Studio in 1948 in their apartment in Chicago, Illinois. The couple rediscovered and refined the ancient art of glass fusing. Essentially, a design is created on an enamel coated piece of glass. This is then covered by a second piece of enameled glass. The two pieces of this "glass sandwich" are then set upon a mold and heated. As the temperature increases, the glass drops into the mold, taking on its shape while the design is fused between to two outer pieces of glass. For added complexity in color and texture, additional pieces of glass can be added. 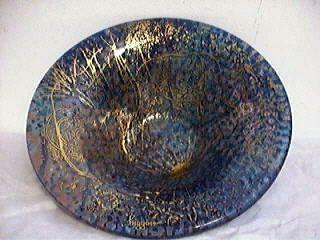 Ashtrays, bowls, plates-all sorts of everyday items-took on a new life in the kilns behind the Higgins' sofa. There was a dazzling array of geometric shapes and curved lines in those designs and the color use was bold and vibrant. This mixture of art and practicality soon led to orders, not only from individual buyers but from major retailers as well, such as Marshall Field and Co. In addition to these, the Higgins Studio also created clocks, bookends, paperweights, glass-topped ceramic dishes, tables, Christmas ornaments, jewelry, "dropout" vases, wall plaques, mobiles, free-standing sculptures, mirrors, church windows, room dividers and even exterior building ornamentation. 1966 saw a break between Dearborn and the Higgins Studio. They worked briefly with Haeger Potteries but soon decided to return to private studio work where they were free to work in their own way and at their own pace. So in 1966, the Higgins Glass Studio relocated to Riverside, Illinois, where it continues its work today under the ownership of longtime Higgins protégés, Louise and Jonathan Wimmer. The Higgins Studio was nothing if not prolific. That means that there are pieces available today for almost everyone. Of course, some are extraordinarily rare and very valuable. For the most part, these can be found in the collections of the Smithsonian Institution, the Metropolitan Museum of Art and the Corning Glass Museum. However, there are still many pieces out there from their days with the Dearborn Glass Company that can be found online, at retailers and at modernist collectible shows and auctions. With a little work, you can still find the perfect Higgins piece. Higgins put a great premium on practicality and their pieces can certainly still be used for the purpose originally intended. However, sometimes you have look past the customary use of the item to find a place for it in your home's decor. An oversized vintage ashtray, for example, could make a great chip bowl while their cigarette boxes can be turned to all sorts of other uses such as candy dishes, change dishes or even a compliment to your dresser vanity. The key thing to remember is that whatever use you find for your vintage Higgins glass piece, whether it is the piece's original use or something new that you come up with, you will be making a striking addition to your home's decor.